From as early as he can remember, musician Matt Heinecke has been captivated by the many sounds instruments make. So when he was offered the position of music director for the Coronado Unified School District in June, it was music to his ears. Prior to his new position, Heinecke served as music director for the Coronado School of the Arts (CoSA), a public school-within-a-school on the campus of Coronado High School, focusing on music, theater, drama, dance, visual arts and graphic design. 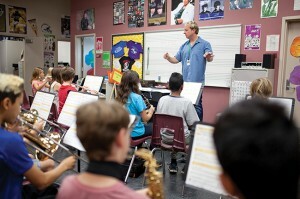 But in January, the Coronado Schools Foundation provided major funding along with the Coronado Arts Education Foundation to begin a band program at the elementary level, including a string class and choir. Heinecke expected total enrollment numbers to be about 20 but was thrilled to learn 60 students signed up at Village and 50 at Strand elementary schools. 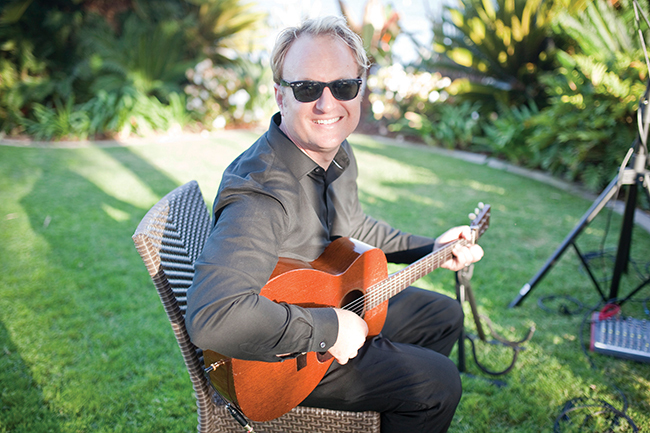 Outside of teaching, Heinecke performs regularly at the local restaurants including Stake and Leroy’s Kitchen + Lounge and books a number of private events and weddings. He also is one of the featured performers at the popular summer Coronado Promenade Concerts held at Spreckels Park. For him, music is a lifelong pursuit — one he’s still learning. And based on his own experiences, he said that it’s important to channel kids’ passion for it early on. 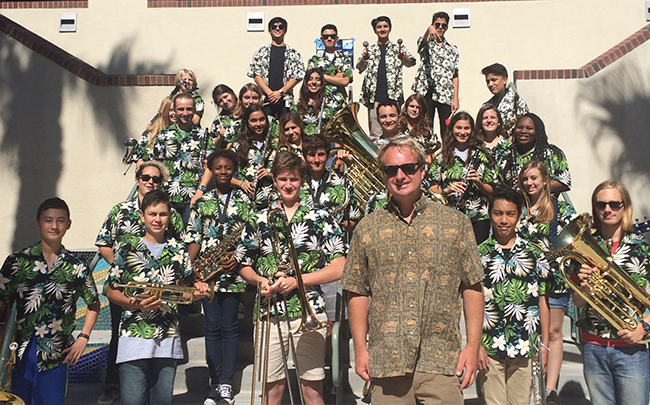 His involvement in Coronado’s live music scene is certainly an added benefit to his students. Evan Agarwal, a senior CoSA bass player and guitarist who had Heinecke all four years of high school, now plays shows around town as well, thanks in large part to his teacher. “Mr. Heinecke has opened doors for me and my classmates, giving us opportunities we would never have had otherwise,” said Agarwah, who, along with classmate Alec Ruiz de Castilla, performed at Spiro’s Greek Café this summer, following Heinecke’s introduction. The music teacher also helped the students build their set list and live performance skills. “The manager welcomed us with open arms because she knew she could expect Mr. Heinecke’s students to be quality musicians,” said Agarwah. Heinecke has found a lot of joy in the recent addition of elementary-level teaching to his repertoire, the age when his music education began. As a third-grader, Heinecke discovered the main character, Ritchie, in La Bamba (a popular film at the time based on the life of Ritchie Valens), who carried a guitar with him everywhere and could swing it around and play it on a whim. 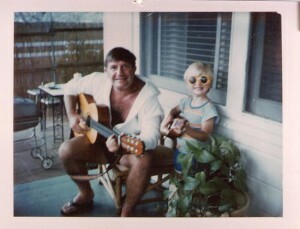 He became enamored with the idea of becoming a guitar player and begged his parents to let him learn to play. Meredith said she and her husband, Walt, didn’t have a lot of money at the time, “But we realized music made Matt really happy. So we saved up and bought him a child’s guitar and lessons. We never pressured him — we encouraged him without pushing him. “You have to watch for the passion, because that will take the child anywhere,” she added. By his second music lesson, Heinecke had mastered the entire songbook. “He was like a sponge,” Meredith said. He was soon flying through three music books a week. Then in fourth grade, Heinecke moved to Coronado and his grandparents, who lived here, showed him the iconic Coronado-based film Some Like it Hot. When he watched Jack Lemmon play the saxophone, a new instrumental passion took flight. “It just looked and sounded so cool,” he said. Soon he picked up the instrument and his musical passions were unleashed in multiple directions. That’s the same type of energy and discovery that Heinecke now wants to help his students, particularly the younger set, tap into. “Their energy and enthusiasm reminds me of what it felt like when I blew into a sax for the first time and it made that huge sound. Finding ways to channel that excitement into something more meaningful is what I’m here to do,” he said. After some artful begging, his parents agreed to let him go in the company of his college sister’s boyfriend who was in college, as long as Heinecke finished all his homework and was not late to school the next morning. But Heinecke was more than eager to go to school the next morning. “I had some real street cred,” said Heinecke, laughing. “I was the seventh-grade kid whose parents let me go to a GNR concert. We didn’t get home until 3:30 a.m. — and I proudly wore my concert T-shirt to school the next morning. To this day, it was the best concert I’ve ever been to. It was larger-than-life, and it changed my life.” The band is still Heinecke’s all-time favorite. In his freshman year at Coronado High School, Heinecke joined the jazz band as a guitarist and for the first time, learned to read music. After graduating, Heinecke began playing shows throughout Los Angeles as a solo artist and from 2003 through 2006, performed in Nashville as a singer and songwriter — he recalls those years fondly as some of the best of his life. He was also the founding member of a popular ‘80s band named Bueller?, which thrives there today. He stopped writing original material after his stint in Nashville; instead he embarked on a new path in music — teaching it. He returned to USC in 2006 for a joint teaching credential and master’s in music education, then headed home to join the staff at Coronado High School. Though he was in the first few rows of the GNR concert that came to town in August and he still speaks of the show with stars in his eyes, his one-time dreams of rock ‘n’ roll are now happily fulfilled by the sight of his students playing classic band or orchestra literature. “I love when my CoSA students perform Holst’s The Planets and his First Suite in E Flat. They’re both standards in band literature, but typically performed by college and professional ensembles. So to see high school students rise to the occasion is so moving and inspiring,” he said proudly. But his pride isn’t reserved for the difficult classics. CHS Principal Jenny Moore remembered a time when he expressed the thrill of his elementary band “nailing” Hot Cross Buns for the first time. “It was really gratifying because he could arguably reserve his talents for the most advanced students, but he was so excited to see future musicians making their first music,” Moore said. Perhaps, like a scene out of Mr. Holland’s Opus, Heinecke will one day look back on his years of teaching aspiring Coronado students as one of his greatest compositions. In the meantime, this music man blends his time teaching, mentoring and performing in perfect harmony. Matt Heinecke, shown here at age 5, has fond memories of strumming away on the guitar with his father, Walt. Heinecke with the Coronado High School Islander Concert Band. 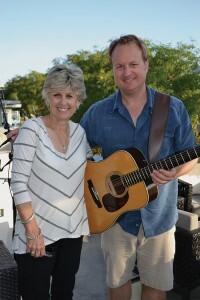 Meredith Heinecke joins her son after one of his regular performances at Stake Chophouse & Bar.